For one week in September, Germany becomes the world focus of public transport when the primarily rail orientated Innotrans in Berlin opens its doors at the same time as the first days of the IAA in Hannover. 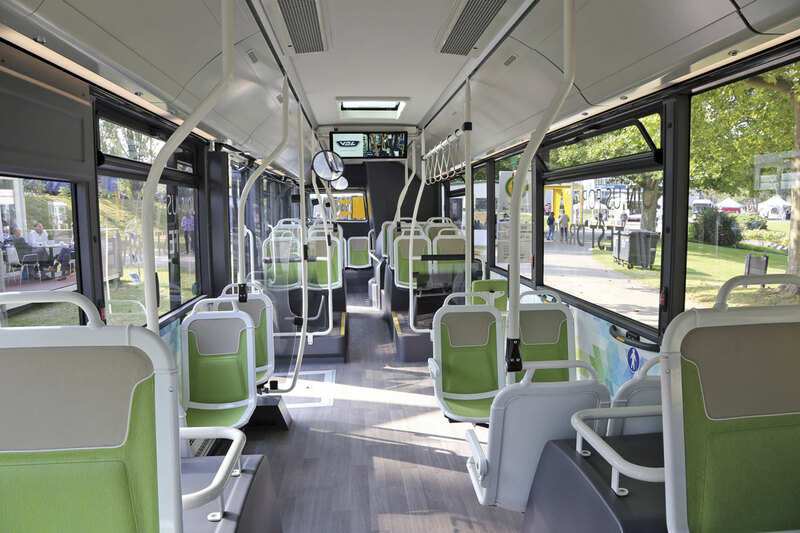 Innotrans has always included a public transport element particularly in respect of information systems and has strived to include a bus element which proves a challenge to manufacturers also showing at IAA. 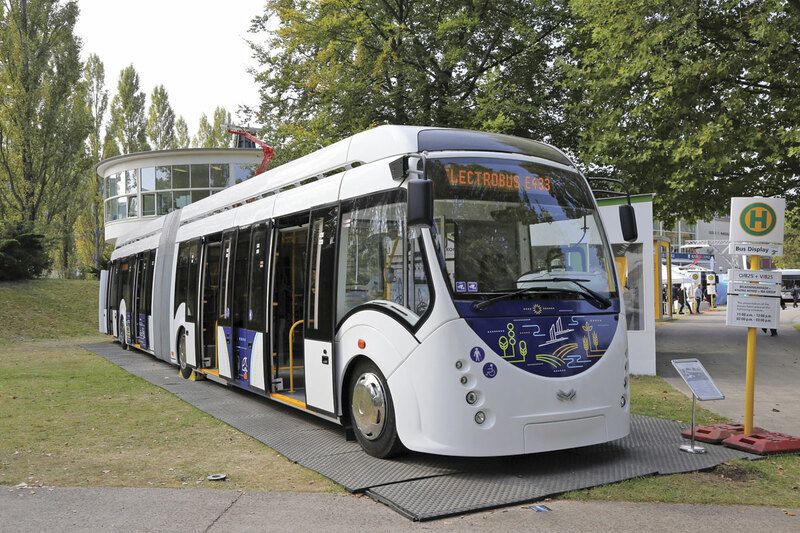 In 2016, Innotrans staged a specific display of electric buses in the Berlin Messe’s Sommergarten with the opportunity for a demonstration circuit albeit at little more than walking pace. IAA also had an outside demonstration zone for electric vehicles and this report combines both events. Our IAA report has already covered the static display of products supporting electrification from several major manufacturers. Of these, only Daimler with a Fuel Cell Citaro borrowed from Hamburg for the IAA internal shuttle and Solaris had vehicles available for on the road demonstration. Much has already been said in these pages about the latest Solaris Urbino E12 following its designation as Bus of the Year 2017 after this year’s Bus Euro Test. Production examples for Hannover and Hamburg were made available for test rides at IAA and Innotrans respectively. Whilst to the same basic specification, the vehicles had a number of detail differences to suit operator requirements, for example fast charging systems. 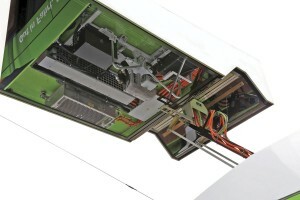 The USTRA Hannover vehicle is equipped with the Schunk system that includes an on vehicle pantograph and the HHA Hamburg vehicle has the Siemens ‘top down’ system in common with other electric vehicles in that city. The Hannover test ride took the vehicle out of the IAA grounds and enabled the performance in normal traffic conditions to be experienced. Acceleration and retardation was brisk and the vehicle appeared to handle well. As expected there was little noise other than the slight hum of auxiliaries although the higher mounting of the ticket machine (compared with the Hamburg vehicle) did appear to cause some vibration around the cab door area. The test ride took in the charging point that has been installed at the designated service terminus on a main suburban street parallel to one of the city’s busiest tram lines. The pole mounted charging point has a mirror finish to the underside which allows a view of the vehicles’ roof mounted equipment, the latter includes a brush strip to clean any snow from the pantograph as it raises. Vehicle alignment is supported by pavement markings at the kerbside and a strategically placed rooflight allows the driver to physically check that the pantograph has lowered without leaving the cab. The Hannover system allows for charging rates up to 450kW and the driver advised that the USTRA instruction was to charge on every circuit. At Innotrans, the Siemens top down charging system was demonstrated and the Hamburg vehicle was available for low speed (and very quiet) test rides around the Sommergarten. The interior was to HHA requirements including USB charging points for passengers which were being jokingly referred to as either an opportunity to save on the bus company’s electric bill or as a range extender by taking power from passenger’s phones! 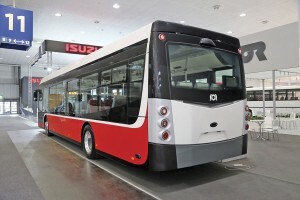 During the IAA, Solaris announced orders for a further 36 electric Urbinos, 20 12m vehicles for Krakow and 16 for Jaworzno, the latter including nine 18m, three 8.9m and four 12m. Whilst in Berlin for Innotrans, there was also the opportunity to sample BVG’s recently introduced Solaris electric buses which feature the previous body design, roof mounted equipment allowing full seating to the vehicle rear and inductive charging at the termini. BVG now uses bold promotional messages in German and sometimes English on its vehicles, one on a Solaris electric bus being ‘emission impossible’! 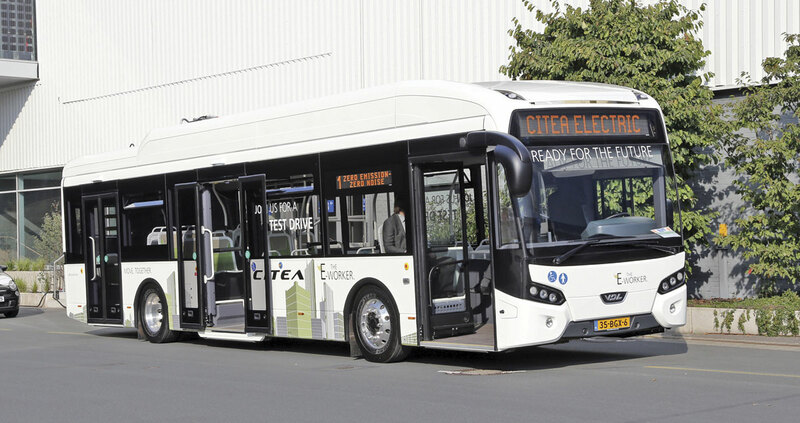 VDL’s electric Citea is achieving considerable success across Europe with almost 100 vehicles now in operation or construction. Operators’ requirements to meet commissioning deadlines meant that only VDL’s demonstration vehicle was available for the two shows and this saw extensive action, initially at Innotrans and, after an overnight transfer, during most public days of the IAA. The demonstration vehicle included a rear mounted 120kWh battery pack, chargeable by a Schunk pantograph or a plug in charger and a single centrally mounted Siemens motor driving a ZF axle. A VDL spokesperson advised of good co-operation with both Siemens and ZF and the benefits of this combination from a service centre perspective, as it is technology that is already known. The Siemens rapid charging system is also an option. On the demonstration circuit at Innotrans, regular use of the warning bell was required but otherwise the ride was quiet and smooth with no rattles. The internal ambience benefited from the use of light coloured cladding and trim for the 26, plus three tip-up seats. Significant fleets of Metro style Citea electric articulated buses will enter service in December with the introduction of eight vehicles in Cologne and 43 in Eindhoven. Development of existing Citea electric fleets continues with Munster set to trial a small trailer mounted fuel cell range extender system. An example of VDL’s MidBasic Electric based on a Mercedes-Benz Sprinter was also available for test rides. This eight seat community vehicle uses an electric powertrain developed with Austrian company Kreisel and is compatible with standard car charging points. To say acceleration and retardation on a test run were brisk would be an understatement. In addition to their stand within Hall 11 at IAA where the latest specification ZA Wheel could be inspected in detail, Ziehl-Abegg promoted an external demonstration area featuring vehicles equipped with its products. 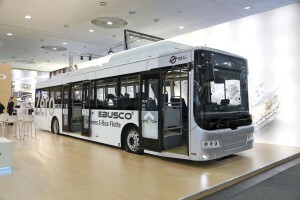 In addition to its own VDL based demonstration vehicle, there were products from Solbus-HyMove, Ekova and Ursus. On test runs in the HyMove and Ekova vehicles, the smoothness and lack of noise delivered by the ZA Wheel was ably demonstrated. Both also offered excellent acceleration and retardation with minimal need to use the foundation brakes. 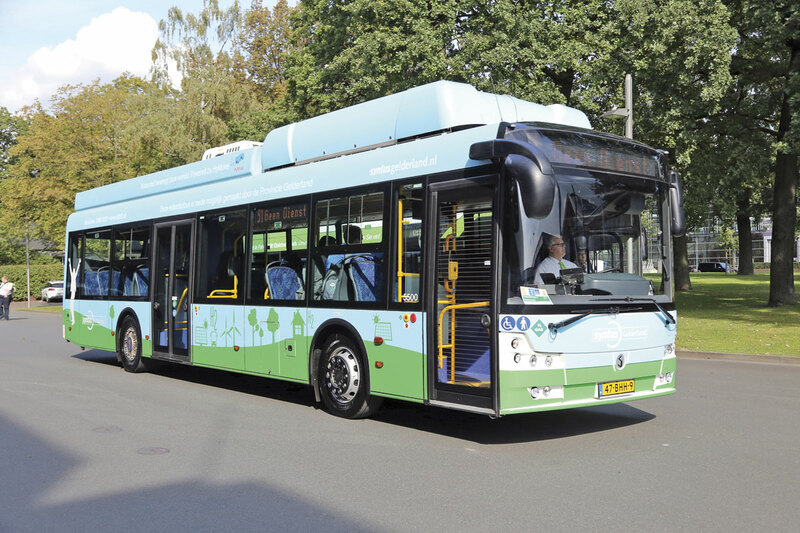 The Solbus-HyMove vehicle which is on trial with Syntus in the Netherlands, was equipped with two 30kW fuel cells developed by HyMove specifically for heavy duty vehicles, offering high durability and efficiency as well as a claimed 15% lower hydrogen consumption. The fuel cells are installed in a 12m bus shell produced by Solbus in Poland and give a range of around 430km on a single 30g filling. Seating capacity is 35 with space for 42 standees on the basis of a maximum 19,000kg GVW. The fuel cells charge two 37kWh NMC battery packs by BMZ that use e-Traction’s control system to drive the 226kW total ZA wheel hub motors. Given that fuel cell buses are some three times the up front price of equivalent diesels and envisioned to still be twice the price by 2020, HyMove is working with a leasing company to develop a package offering vehicles, fuelling facilities and hydrogen on a price per km basis. A minimum operation of 20 vehicles at one location would be required. In winter, heat generated from the fuel cells can be used to heat the interior removing the need for a fuel consuming system. The Ekova Elektron demonstrator was the vehicle seen at Kortrijk in 2015, which the Czech Republic based company had developed on the basis of a structural design acquired from former bus producer Tedom. The bus features a total battery capacity of 265kWh mounted on the roof and in the rear overhang together with an e-Traction power system, to deliver a 230km range with the air conditioning in use. A VeriCity online diagnostic system allows both the operator and manufacturer to monitor the status of the batteries. Deliveries so far include five 12m vehicles for operators in Germany’s Hohenlohekreis where Ziehl-Abegg is based and seven to Sweden including two 18m examples. Ursus S. A. has relatively recently returned to bus manufacturing alongside its role as a leading producer of tractors in Poland. It previously produced buses between 1927 and the early 1940s. Alongside Euro6 diesel buses, Ursus Bus is targeting the emobility market with its City Smile range that is offered with ZA Wheel or central motor drives and battery, fuel cell or battery with fuel cell range extension electric power options. The fuel cell options are seen primarily for export markets such as Germany and the Netherlands, the company citing the lack of an automotive hydrogen filling station network in its home market. 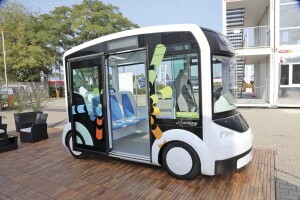 Ten battery powered vehicles are to be supplied to Warsaw. The vehicle displayed featured two 30kW HyMove fuel cell modules giving a minimum range of 450km on a single 30kg hydrogen recharge which takes around ten minutes. Passenger capacity of the 12m vehicle is 75 including 28 seated. 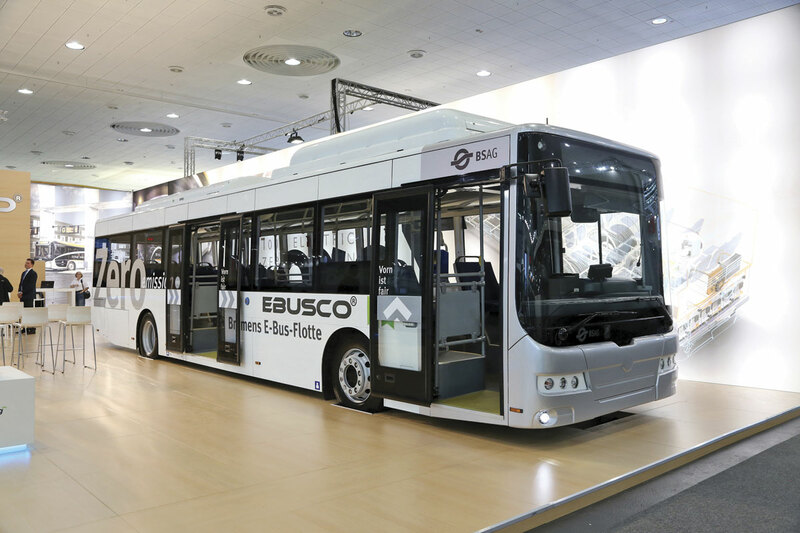 Ebusco featured two of its 12m vehicles at IAA, a new vehicle for BSAG Bremen within hall 11 and available for test rides, the demonstration vehicle which appeared at Kortrijk in 2015. 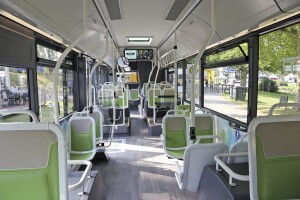 The latter, with its distinctive street plan seat trim was borrowed from long term trials with Transdev in the Ile-de-France region. This operator has subsequently ordered eight similar vehicles. Ebusco have placed emphasis on achieving maximum range on a single charge through lightweight construction and high energy density batteries totalling 311kWh, 92% of which is usable between charges. Ebusco developed LTO batteries, suitable for slow or fast charging and supplied by Yin Long Energy are installed 60% under the floor at the rear and 40% on the roof. The aluminium body structure, produced in China by Xiamen Golden Dragon, incorporates ZF axles, a 220kW Ebusco developed motor and a Thermoking heat pump heating and cooling system. An extensive cold weather test programme has taken place in Norway and Finland to confirm that battery performance is not impaired at low temperatures. Battery charge status, voltage and temperature are continuously measured to a high level of accuracy and can be online monitored to determine at an early stage whether intervention is required. 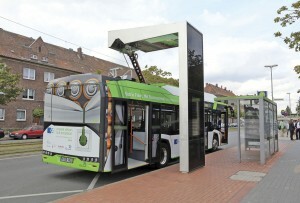 Czech Republic based SOR have been producing electric buses since 2010 and have supplied around 30 to date, mostly to operators in their home country or Slovakia although there are three in Germany and one in Zurich. They are to a variety of lengths between 8.5 and 12m. The new 12m SOR City model, fully developed and attractively styled in house is designed for a maximum GVW of 18.8tonnes. 35 Ster seats are installed in the vehicle that was shown in three door form with a low floor throughout. The roof mounted 225kWh capacity NMC batteries are suitable for slow or fast charging via cable or a Schunk system compatible pantograph, the show exhibit was equipped with the latter. Axles are from ZF and the 160kW centrally mounted motor is from Pragoimex with whom SOR have previously worked on trolleybuses. The design range is 200km with the capability of extending to over 300km with opportunity charging. SOR quoted a price of around €400,000 for the complete vehicle. SOR operate a monitoring system for the battery packs that provides automatic notification of any cell going out of tolerance. 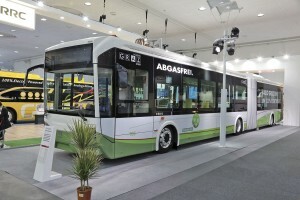 The company cited experience with their initial four electric buses which have covered around 1m km since 2010, during which time only 20 of the 420 cells installed have required replacement as being out of tolerance. For independent range extension, SOR is working on a fuel cell based range extender. 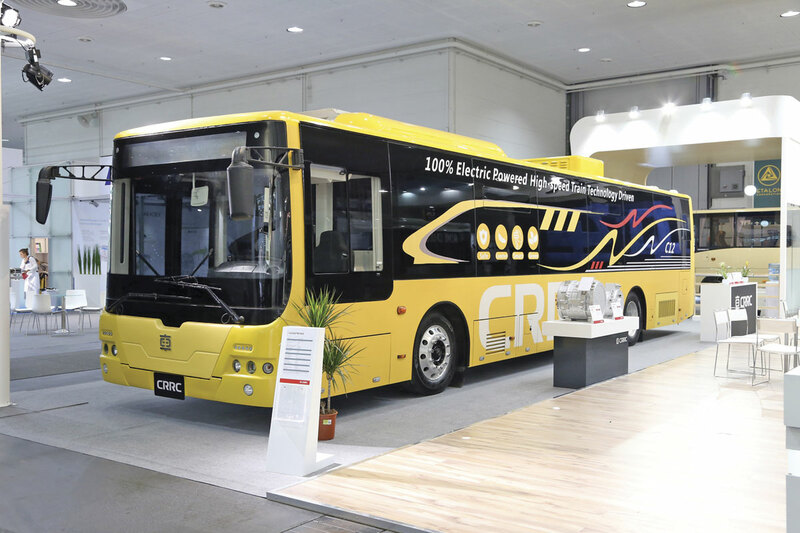 Perhaps one of the largest producers of electric buses that very few people are aware of, CRRC, has regularly exhibited its railway and tramway technology at Innotrans. 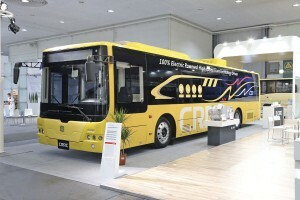 Its range extends to high speed trains and the company promotes the use of technology from this area in their development of a full range of electric buses. The company claims to have supplied several thousand such vehicles ranging from 6.5m to 38m across China. 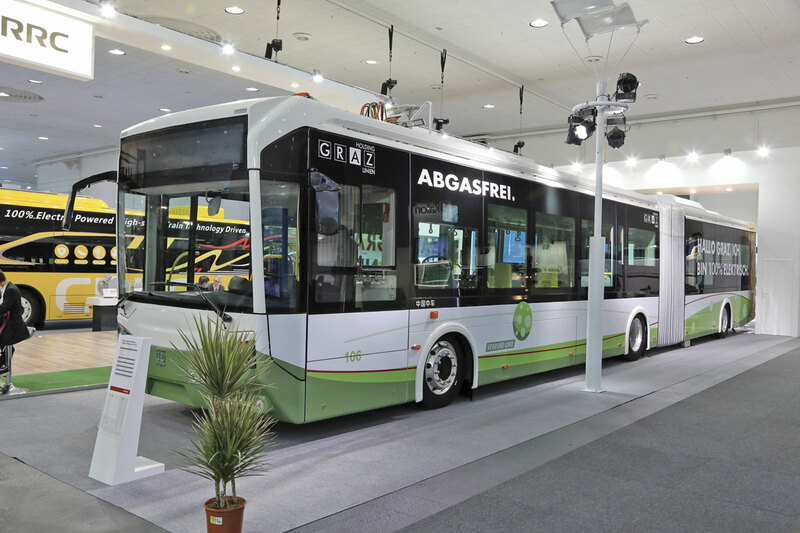 Two significantly different examples of these were displayed by CRRC’s Vienna based European electric bus subsidiary, Zhejiang CRRC Electric Vehicle Company, on a large stand at IAA. 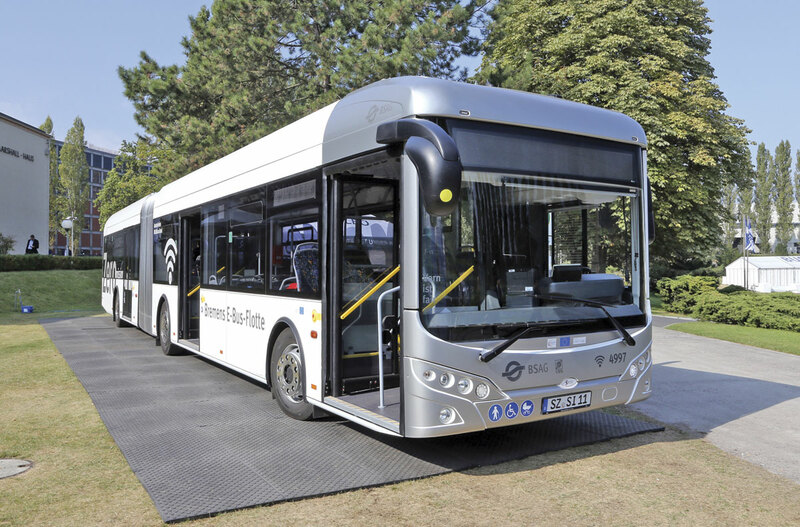 Most striking was the CSR6180GSEV1, an18m articulated bus for Graz with reverse raked front screen, a feature that appeared contrary to the aerodynamics required to minimise power consumption on an electric vehicle. 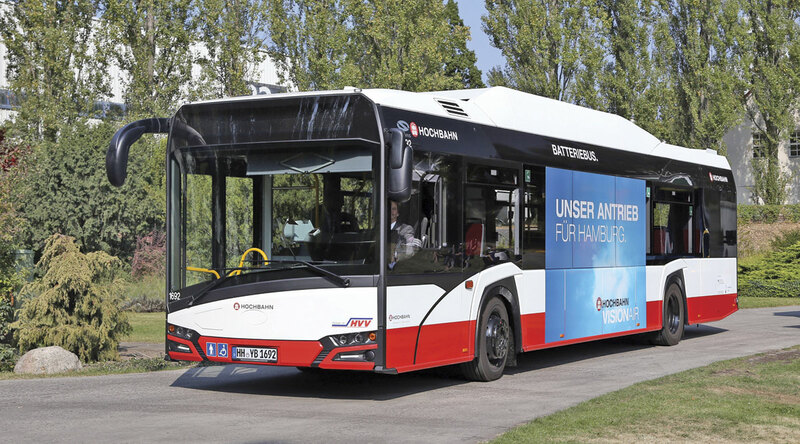 The 28tonne gvw, 135 passenger capacity vehicle was equipped with super capacitors and a small LTO battery with the intention of rapid charging at intermediate stops in addition to termini. 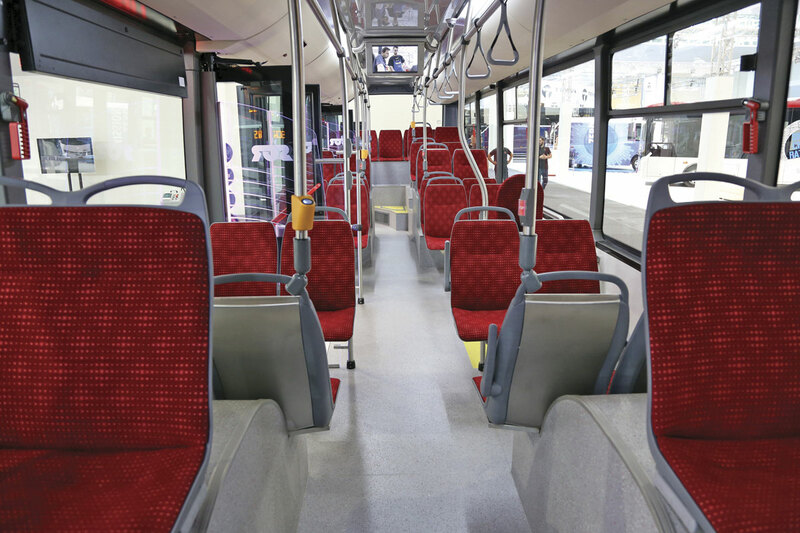 The second exhibit was the C12, a typical 12m Chinese city bus that was a long way from European specification although it featured higher quality seating and floor coverings than would be expected as well as USB charging points. All seats were raised on podiums and the position of stanchions and rails impinged on access to some seats. Claimed to offer a 200km range, a total 201kWh of MNC batteries were mounted on the roof and at the rear to drive a centrally mounted 150kW motor. There was obviously awareness of the vehicles’ potential and it was interesting to witness discussions between the Chinese and a (probably) Polish operator with double interpretation via English on the extensive detail changes that would be needed to meet their requirements and European standards. The Bozankaya Group, supplying electric equipment across the railway industry, is a regular exhibitor at Innotrans and not surprisingly its Sileo electric bus subsidiary took part in the bus display there. The Sileo S18 shown was destined for BSAG Bremen and is guaranteed by the producer to have a minimum range of 250km on a single charge. 300kWh Lithium Iron Phosphate battery capacity is installed, intended for overnight charging. The 18m articulated vehicle features two ZF electric axles giving a total of 480kW to handle a maximum GVW of 28tonnes based on a 137 passenger capacity (51 seated). Unfortunately, a driver was not available for a demonstration of the vehicle on the final afternoon of Innotrans. From Belarus, Belkommunmash showed an 18m metro styled articulated bus, the E433 Vitovt Max Electro, at Innotrans, unfortunately as a static display only. In contrast to the other Innotrans exhibits, this vehicle featured Chinese ultra capacitors produced by the Shanghai Aowei Technical Development Company. Only 34kWh of energy storage is installed which means, with the ultra capacitors having an energy density of 90Wh per kg, there is little weight penalty over other means of propulsion. The company claims they offer a ten year life and can be charged at up to 480kW. The vehicle design dates from 2006 when it was introduced by Belkommunmash as a trolleybus and has also been available with an additional diesel motor or LTO battery pack for off wire operation. 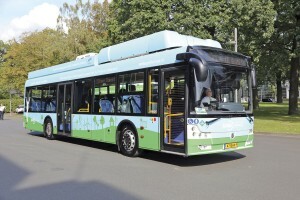 The ultra capacitor vehicles are intended for use from the beginning of December on city services in Minsk where none of the routes exceeds 12km. Recharging, taking five minutes, will take place at the end of each journey when the vehicles are expected to have 30% stored energy remaining. Within a 28tonnes maximum GVW, 153 passengers can be accommodated, 38 seated. Hyundai are taking a significant role in the development of the European market for fuel cell powered electric cars and light commercial vehicles. They are now considering taking this work further with a minibus based on their H350 van model that in diesel form is built for Europe under contract by Karsan in Turkey. The company’s stand at IAA featured a cut away shell showing the location of key components under the vehicle’s floor. These include a rear mounted fuel cell developed in Korea, 136hp electric motor and four 700bar composite hydrogen cylinders mounted underfloor which would give a 500km range. No interior space is lost enabling a maximum passenger capacity of 17 to be achieved. 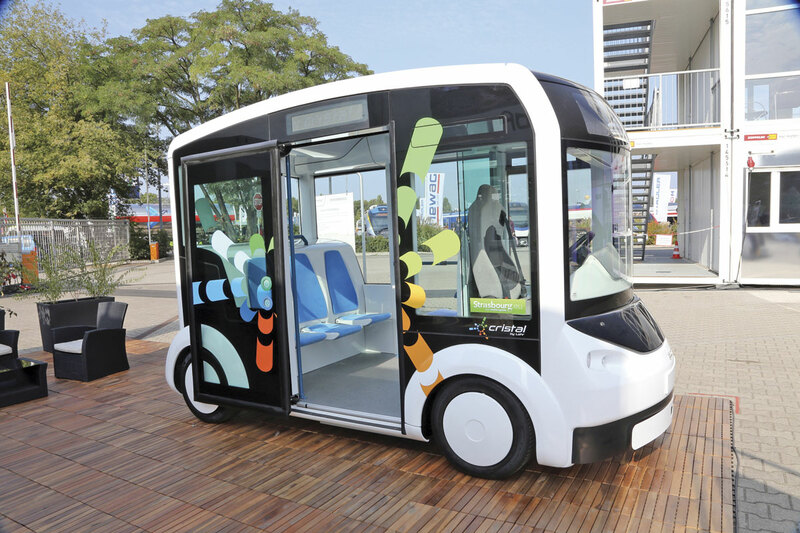 At Innotrans, the French Lohr Group, known for innovative road rail freight vehicles and guided bus systems, showed its modular vehicle system Cristal that is to be trialled between the University and Medical Campuses in Strasbourg. In its simplest form, it is a car sharing system where individual units can be booked online and collected from predetermined locations. The units, can, however be platooned with a professional driver in the leading unit. They have an expected range of 150km based on an up to eight hour overnight charge. A number of equipment suppliers also contributed to the bus display at Innotrans including Siemens with its ‘top down’ charging infrastructure used in Hamburg and gaining in interest in the drive for a standard charging methodology across Europe. It features a pantograph from Wabtec subsidiary Stemmann and an aesthetically pleasing multifunction housing by Gahlow Design from Hamburg, both companies also taking part in the display. A Siemens spokesperson advised that the charging infrastructure had a design life twice that of the vehicles themselves so, depending on fleet size, could offer significant cost savings over vehicle mounted pantographs as well as removing weight from the vehicles. In the world of electromobility, nothing is standing still and there appears general consensus that there is no ‘one size fits all’ solution. Meeting operators’ needs for flexibility, range and cost remains at the forefront of manufacturers’ objectives but both shows demonstrated positive steps towards compatibility in the operating environment. Looking forward to their next editions, further significant and exciting developments in electrification can surely be expected. Before the next Innotrans, Messe Berlin intends to stage a specific pcv congress and exhibition, BUS2BUS, on 25-26 April 2017.